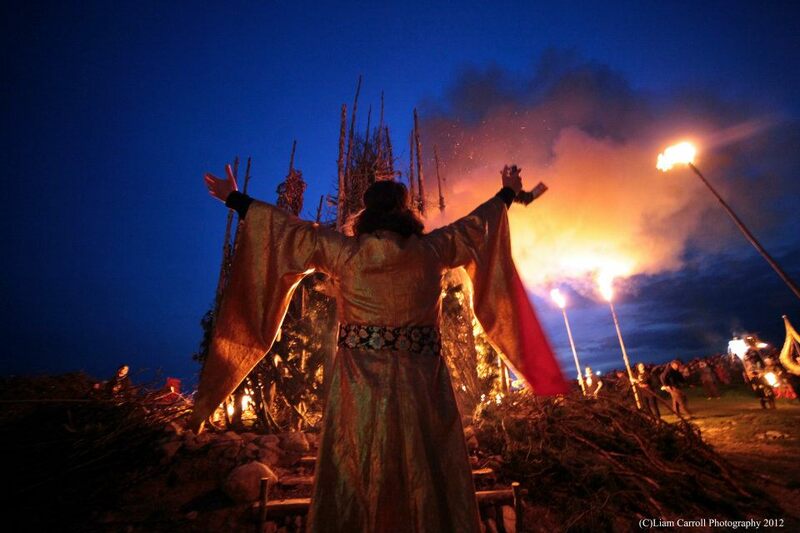 Festival of the Fires will not be happening as it has done since 2009 upon the Hill of Uisneach. 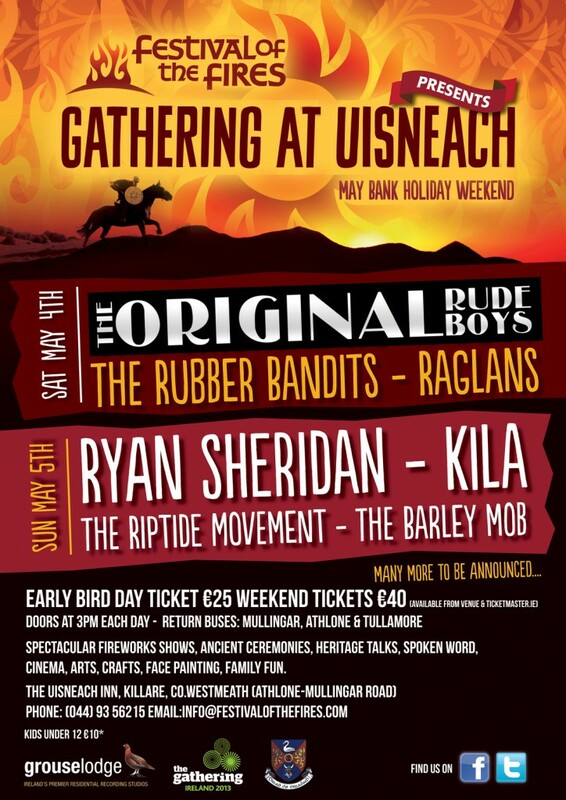 We are giving the Hill a year off this year, and instead some of the people behind the award-winning festival are hosting ‘The Gathering at Uisneach’, a boutique two day music festival at the Uisneach Inn venue at the foot of the Hill of Uisneach. This is happening on Saturday May 4th and Sunday May 5th, featuring music, comedy and spoken word from The Original Rudeboys, Rubberbandits, Ryan Sheridan, The Riptide Movement, Kila, Irie-Land, The Barley Mob, Cronin, Driftwood Manor, Fox E & The Good Hands, Just No and many many more. They are on sale from Ticketmaster outlets nationwide, ticketmaster.ie and in person at The Uisneach Inn venue itself, Days Bazaar in Mullingar, Rochforts/Mullingar Music in Mullingar, Foxes Fruit & Veg, Mullingar and Midland Sound, Athlone. To keep the flame burning in 2013 and to celebrate the year of ‘The Gathering’, the people behind Festival of the Fires, supported by Westmeath County Council and the Irish Public Bodies Insurance, are to host a series summer gatherings in the shadow of Uisneach. These Uisneach Gatherings will take place throughout the summer in a bespoke festival area close to the recently re-opened Uisneach Inn venue in the foothill of Uisneach. The first will take place over the Bealtaine, May Bank Holiday weekend, on Saturday May 4th and Sunday May 5th featuring many of the elements that made Festival of the Fires Ireland’s most iconic event – amazing music from some of the top international and Irish acts, arts and crafts, family entertainment, spoken word, local food and drink, historic talks and, of course, the legendary Uisneach Warriors. Music will come from the Original Rudeboys, Ryan Sheridan, The Riptide Movement, Rubber Bandits, Kila, The Barley Mob, and many more. In June, Damien Dempsey will headline the Bank Holiday event, with some great acts in support. Full details will be revealed shortly. The Gatherings at Uisneach will feature many aspects of Festival of the Fires, and in the year of ‘The Gathering’ they will keep the Bealtaine flame burning all summer long, beckoning many visitors to the centre of Ireland to enjoy the very best of Irish culture and hospitality. Stay tuned to these pages and like our Facebook page to be first with the latest news!